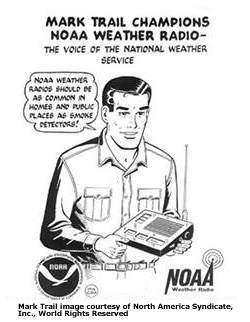 NOAA Weather Radio All Hazards is a nationwide network of radio stations broadcasting continuous weather information directly from a nearby National Weather Service office. NWR broadcasts weather warnings, watches, and forecasts, and other hazard information, 24 hours a day. It is provided as a public service by the National Oceanic and Atmospheric Administration, part of the Department of Commerce, and includes more than 940 transmitters, covering all 50 states, adjacent coastal waters, Puerto Rico, the U.S. Virgin Islands, and the U.S. Pacific Territories. Skywarn is the spotter training program developed and sponsored by the National Weather Service. In areas where tornadoes and other severe weather is a frequent concern, the NWS recruits volunteers, trains them in storm identification and spotting procedures, and subsequently accepts the spotter's reports during episodes of severe weather. StormReady - Some 90% of all presidentially declared disasters are weather related, leading to around 500 deaths per year and nearly $14 billion in damage. StormReady helps arm America's communities with the communication and safety skills needed to save lives and property.